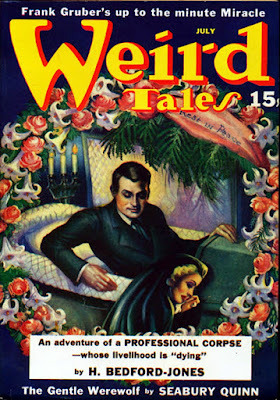 For many years the WEIRD TALES in the forties had the reputation as being inferior, etc. But I've found the issues to be of great interest and the artwork to be of high quality. I like the forties and if you collect WEIRD TALES then you have to collect them also. As far as actual issues of WEIRD TALES go, I've owned and read more of them from the Forties than any other decade, because they were more affordable. I always enjoyed them, too. I like the '40s issues, too. A different cast of writers from the '30's, some really good. Howard and Lovecraft gave way to Wellman, Bradbury and Leiber. I've never been afraid to suggest the McIlwraith WEIRD TALES is better than the Wright WT. Not least because the writers tended to be better, or to have found their own voices (Bloch, most obviously).